This generative work produces narratives about a mythical sea voyage undertaken by two characters, an owl and a girl. 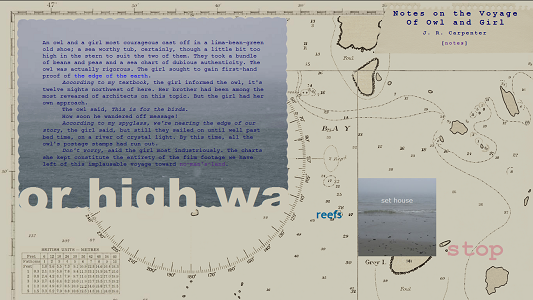 Framed over the gorgeous image an old sea map, each iteration of the story unfolds in a text that lasts 40 seconds before being generated anew, which is sufficient time for most readers to get to the end, but without being distracted by links. Readers that follow links to the shifting islands found in Wikipedia to get information about some of the story’s contexts are likely to return to a different story, in which the information gleaned may no longer be relevant. This disorientation resonates with the owl and girl’s journey, who aided by various navigational and communication technologies, travel beyond the edges of the known, leaving behind some incomplete records of their adventure. I will not translate the encoded coda for this work, but you can copy and paste the sequence into a decoder, which will allow you to listen to it and read it in English. Its message leads to reflection upon the work as a whole that may lead to further exploration of its narrative geography. The boundaries of this work are as leaky as some of the ships and cartographic knowledge of the seas referenced in this piece. In addition to the links to Wikipedia, most of the references for the images and marquees are credited in the notes, with the exception of coda referenced above, quoted from a work represented in the following URL: …. – – .—. —-… -..-. -..-. . -. .-.-.- .— .. -.- .. .—. . -.. .. .- .-.-.- —- .-. —. -..-. .— .. -.- .. -..-. -… —- .-. -.…-. .-.. .. -…-. … (encoded to avoid “spoiler” effect). There are flows from other works by Carpenter, such as a QR code in “The Broadside of a Yarn” that brings up a web page with the story generator. It also contains lines from her poem “up from the deep,” published in Jason Lewis’ iOS “Know” app. She spins a sturdy yarn from these fibers.